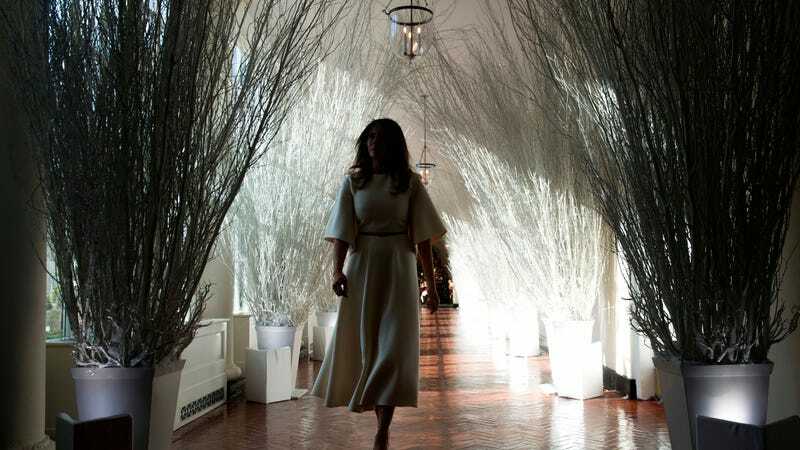 The holiday in question, in case you were checking your calendars, is Christmas, which in Melania Trump’s mind apparently conjures up the naked terror of running through a dark forest, alone, pursued by wraithlike shadows and the grasping claws of brittle, dead branches, the only sound the cackling of the ancient witch who will grant your wish to be rich and famous with a designer wardrobe and a gold-plated toilet… for a price. This comes after Ivanka Trump’s cheerful suggestion of placing a giant shell full of driftwood and moldy produce on your Thanksgiving table in honor of Bokrug, The Great Water Lizard earlier this month. It all points to a certain occult (but not necessarily satanic, as the pedants behind the Church Of Satan Twitter account love to point out) tendency buried within the otherwise extremely tacky Trump aesthetic, which makes sense given that—to continue the Lovecraftian theme—the sight of their patriarch does seem to have driven a certain segment of the American population incurably insane.